Campaigners in the UK have labeled BP chief executive Bob Dudley’s pension scheme “excessive,” after the oil tycoon pocketed £1.7 million in pension benefits last year. Dudley’s award is roughly 10 times the average pension payment received by a FTSE 100 director and 62 times the average annual salary in the UK. News of his benefit prompted hostility after BP posted a 10 percent fall in profits in February. The oil giant also announced it would be cutting capital expenditure by between $4 billion and $6 billion this year. This is in addition to £665 million cost-cutting drive, which involves sacking 200 full-time onshore positions and 100 contractor roles from its North Sea workforce. The company blamed reduced profits on falling oil prices. Shareholders were encouraged to revolt against Dudley’s £8.6 million pay package in February, which marked a 25 percent increase on his previous years’ salary. Proxy voting company Glass Lewis, owned by Canada’s Ontario Teachers’ Pension Plan and Alberta Investment Management, urged BP stock owners to vote against the pay rises. 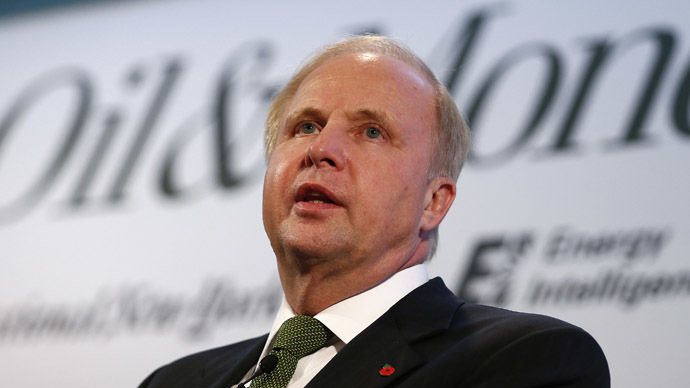 Glass Lewis said BP’s senior management received bonuses worth 73 percent of the company’s maximum limit in 2014, despite missing key performance targets. Luke Hildyard, deputy director of High Pay Centre, said remuneration needs to be accountable to people from outside the corporate elite. Speaking to RT, he said: “A pay package of this size seems excessive, but three out of four members of the BP remuneration committee are also former top executives and management consultants, who are unlikely to see anything out of the ordinary about a multi-million pound pay package. “Former executives are instinctively sympathetic to other people in their position and think they deserve to paid huge amounts of money. They perhaps don't understand how a £1.7 million pension payment might look to ordinary workers across the wider economy who are seeing their pensions cut to the bone. “This type of arrangement is fairly typical of a major UK company and highlights why the executive pay setting process needs to be accountable to people from outside the executive class,” he added.